The high school girls traveled to East High School on Tuesday (10/9) for their last dual meet of the year. With a victory, the girls would be crowned regular-season conference champions for the second straight year so they were in it to win it! But it wasn’t without some excitement! From the first sound of the horn, the Rails jumped out to a lead. The medley relay (Mangin, Dooley, Zaugg, Douds) won in 1:58.73. But the team didn’t stop there. There was even a tie for 2nd in the 200 Free! From JV to Varsity, the team wanted to end the regular season strong. 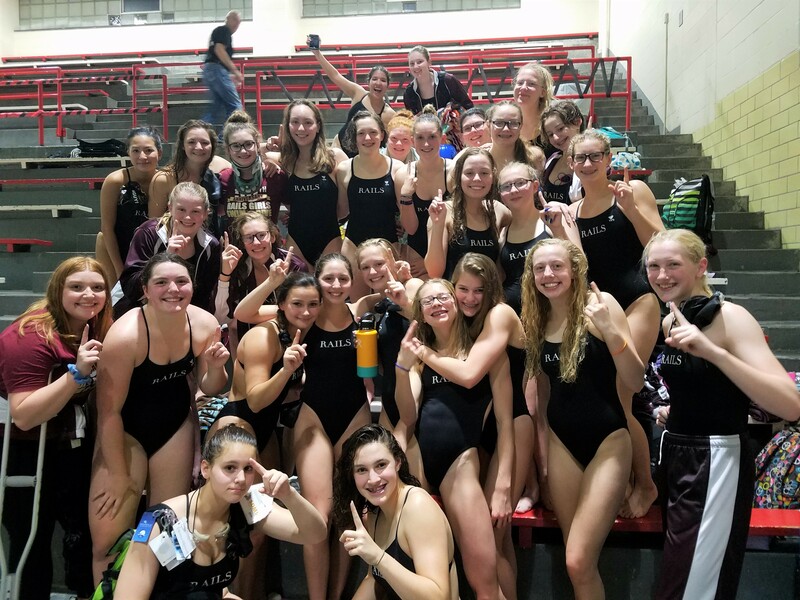 In the JV 50 Free, the Rails took top 3 honors, along with the top spot in several other events. Varsity swimmers raced to their own top three finishes in the 100 Fly and five other events! From there, the meet made some history for different reason. For the first time ever, the team had to shelter during a tornado warning! With a brief break in the weather, the meet was called early ending with the last three events un-swam. None-the-less, the Rails won in a dominating performance, 99-25! In fact, Rails took top three honors in 4 of 6 individual varsity events! Below are few highlights from the meet. All conference girls are in the midst of their taper, so look for big swims at the conference meet next Tuesday (10/16). Below are few photos from the meet. Check out more on the team’s photo website. A log-in is required.